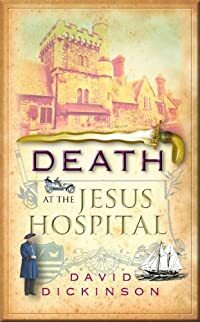 Death at the Jesus Hospital by David Dickinson: Synopsis and Online Purchase Options. Synopsis (from the publisher): Three men are found with their throats cut, and all are connected in some way to an ancient City of London livery company, the Silkworkers. Lord Powerscourt has no shortage of suspects or suspicions. The first victim had shadowy links with the Secret Service. The second had wiped fifteen years out of his own past. The third, a man who collected women at church during Christmas Carol services, had been threatened by angry husbands and disinherited sons. All the victims had been opposed to the reorganization of the Silkworkers' finances and, interestingly, Sir Peregrine Fishborne, the head of the Silkworkers, was present just before each victim's death. Lord knows that the key to solving the mystery lies in the strange markings found on the bodies, which no coroners can identify.